Our clients avail from us hot stamping foils which are crafted from the best of the materials. These foils possess amazing features making it suitable for the diverse applications. These foils are available at market leading rates. 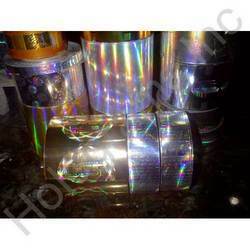 We are reputed holographic aluminum foils manufacture. The foils offer outstanding functionality. Our range of aluminum foils are highly desired by our clients. The applications of these foils can be seen in pharmaceutical industry. Looking for Hot Stamping Foils ?